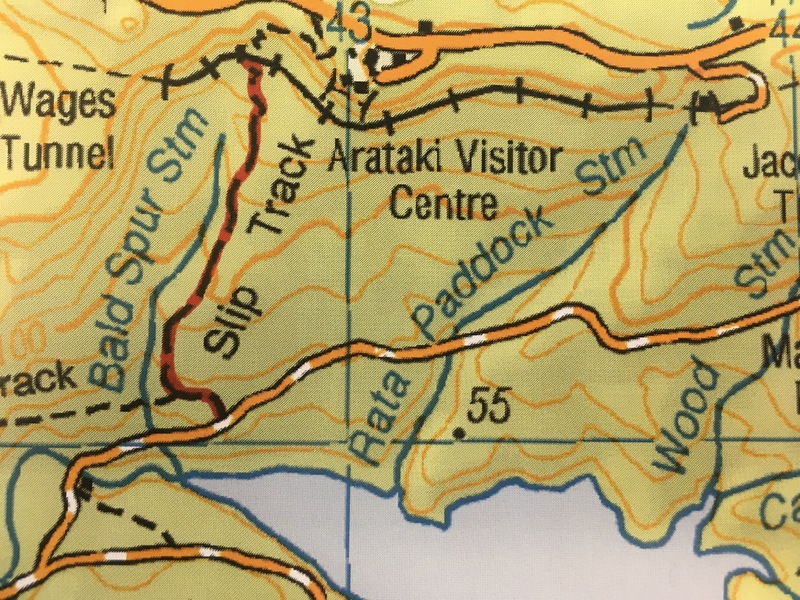 Tramping Track – Slip Track is a wide track climbing steeply from Pipeline Track, reducing in width until it reaches an open grassy area and small ditch (20 minutes). 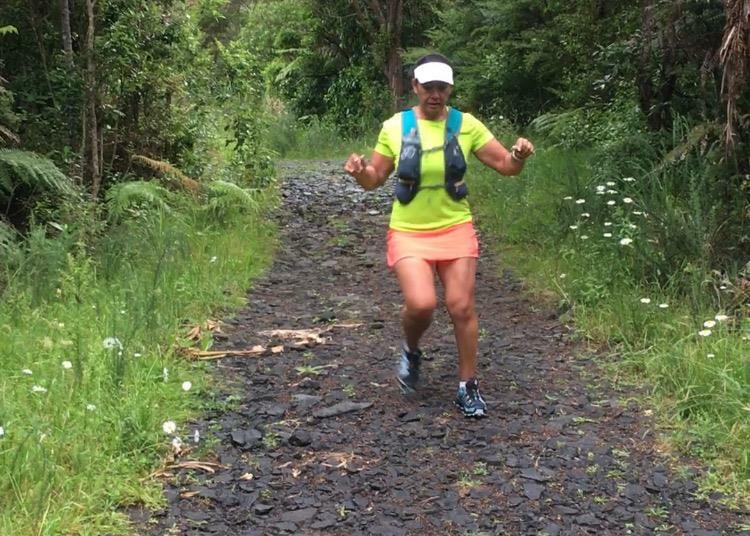 The track narrows after the ditch and climbs, crossing Nihotupu Tramline to meet Scenic Drive. 900m. (Source). From the large carparking area in front of the Arataki Visitor Centre, you follow the gravel path past the large Hillary Trail sign and ascend the bush covered track that hugs the hillside for a couple of minutes until you pop out in a clearing high up on the hill. Straight ahead of you is the shoe cleaning station at the start of the Slip Track and on your left is a raised viewing platform. The view towards the southern end of the Waitakere Ranges and the Manukau harbour are worth the slight detour, especially on a clear day. From the shoe cleaning station Slip Track descends into the Nihotupu Valley. At first Slip Track a well maintained yet very narrow single track and although underfoot is a compacted gravel surface it’s still relatively soft which my knees are thankful for as the trail descends quickly and has quite a few hairpin bends in this section. After crossing the Nihotupu Tramline (which the now defunct Rainforest Express once carried visitors along) and crossing over the aforementioned ditch (which now has stairs on either side) the track widens and and starts to descend steeply. In saying that I’d much rather descend Slip Track than climb back up it ..
After running the Pipeline loop anti-clockwise a couple of times (which includes descending Slip Track) I decided to try running it in a clock-wise direction. It was all going well (and so much easier) until I got to Slip Track and although I completed the 6.5 km loop marginally quicker it hurt a lot – holy hamstrings and lungs! What doesn’t kill you .. Directions (from the CBD) – Take State Highway 16 (north western motorway) and head west. Take Exit 2 onto Great North Road and follow signs to Titirangi. Drive through Titirangi Village and at the roundabout, take the Scenic Drive exit. Continue for 6km and the visitor centre is on the left. Toilet Facilities? – Yes, located inside the visitor center.